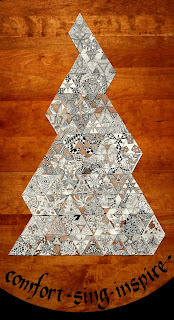 Zentangle: Twelve Days of 3Zs - Gratitude! Twelve Days of 3Zs - Gratitude! Thank you all for the outpouring of creativity, sharing and appreciation! Anonymous - Jackie CZT XIII - was written in the actual posting. Please email "zentangle [at] gmail [dot] com" with your shipping info so we can send you your gifts! Last week the Zentangle staff visited the Providence Biltmore where we will hold next years CZT training seminars. While there we shot this video (one take, no edits!) to celebrate this fun series. And a tile full of tripoli! If you thought we were a big company, well, here we are . . . family, friends and neighbors who love to work with each other and for all of you in this worldwide creative and appreciative Zentangle community. We never take it for granted. Thank you! And thank you again for all who commented, shared and enjoyed this year's Twelve Days series. 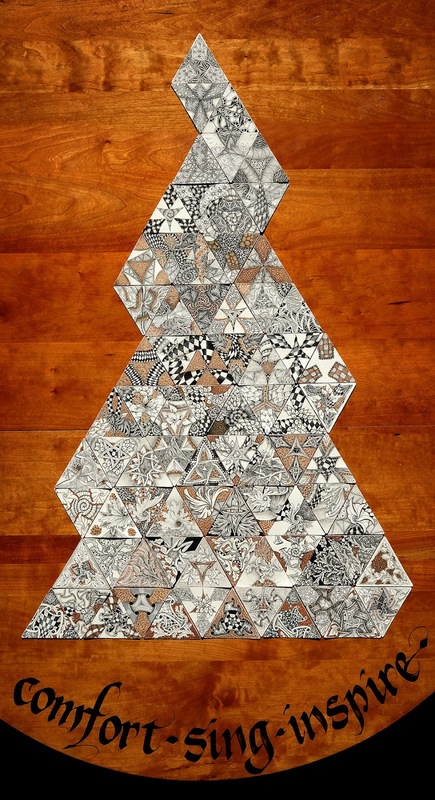 We are in awe to watch this renaissance in Zentangle Art. We love that this creativity seems to build on itself, inspiring others (and us) to explore new possibilities . . . and then share it back with everyone. You can see so many of these sparkling creative gems on the Zentangle Mosaic app (free to view on iPhone, iPad and Android smartphone). We are so proud of and grateful for all the artists who have allowed us (and everyone) into their "portphonio" of Zentangle art. Here's a mosaic of all twelve day's 78 tiles. Each row represents one day! 'Til next year, Our Best Good Wishes for a wonderful life. Rick, Maria, Bijou, Alfie and all of us at Zentangle HQ! So much fun to watch you all enjoying singing the 12 days of 3Zs! It was a wonderful 12 days of creative sharing, inspired by this challenge and the group of you at zentangle HQ, to reach outside and stretch our collective selves. So much joy in participating and tickled to have won to boot! Honestly the true gift is what you offer this community every single day. Thank you. I am grateful to have discovered zentangle. A wondrous Christmas to you all and a new year filled with family and friends, love and laughter! I am soooo excited to be on the list above! These will be my first real tiles outside of the ones sent to me by my travel buddies, and my very first prestrung. I can't wait 🤗 Thank you so much for this awesome challenge and for helping me stretch myself and expand my list of go to tangles. Merry Christmas!! I couldn't believe my eyes when I saw my name in the list! Thank you so much for this wonderful present. I absolutely love the 3Z tiles. I loved joining the 12 days challenge. Thank you so much for organizing it! The was a lot of work, I can only imagine. Wishing everyone that loves Zentangle happy holiday and a wonderful 2017. Thank you all for this wonderfull challenge. So inspiring for everyone, you have proven that once again. I was curious and excited to discover every day a bit more and see the mosaic growing. I wish you all a merry Christmas and the best for the New Year. I am so so happy to be on the list of recipients of this wonderful gift! I am feeling so blessed, not just by the gift of tiles, but also by the community, support, and genuine caring I have experienced these past months. Thank you, for all that you do. I know a lot of people have stories about how the practice of Zentangle has made a difference in their lives. I know it certainly has been that for me, and a time of emotional/spiritual healing I have been going through since June. Sending all of the Zentangle family and community much love this holiday season. Loved your 12 days of 3zs. You all are awesome. Congratulations to all the lucky winners. I feel so blessed to be part of this amazing Zentangle community. May 2017 find everyone healthy and happily tangling away! Congrats to the winners, and thank you so much for sharing 12days of 3Zs, I had a wonderful time drawing and exploring all the beautiful tils drawn by our community, happy Merry christmas and all the best wishes for 2017! Thank you for a wonderful little journey of tiles running up to the festive season. As PamS commented - the real prize is the gift you've given to so many with a way of creating patterns, a pen in my hands is no longer just a tool for writing with. Thanks again & have a Blessed Christmas & New Year. This was such a fun event. Thank you so much. I am still really curious about the book Alfie and Bijou used in their photo shoot. Happy Holidays. Thank you for the 12 days of fun!!!! Yahoo! Lucky to see my name on that list! My first time engaging in such an activity and loved every moment. A bit intimidated at first but after a few tiles a comfort level set in! Surprised myself! Belgium! Special place to me. Both my parents from Belgium - Flemish! Loved your 12 Days of 3Zs song. It bought a smile to my face. Thank you for running the 12 Days of 3Zs. It was so much fun. It was also very inspiring to see what others had created as well. Merry Christmas to All. I look forward to a wonderful 2017. Soooo, fun to see your video (Martha, no fair hiding! ;-) and so fun to see so many names I know (even though we've NEVER met :-) and follow on Mosaic! It made me feel like I'd won too. Congrats to everyone for being a part of this great "family"! Blessings to All! And very best wishes for a Zentangle-full 2017! Congrats to all the winners, which really includes all of us, even if we weren't on the prize lists, because we all had a good time doing these 3z's (🎶we 3z's of Zentangle are...🎶 haha). It would be fun to know who each of these singers were, because other than Rick, Maria, and one or two others, many of us do not know who these gentle carollers are! Happy Hol's and Merry Christmas, to all. Congratulations to the selected winners! Merry Christmas to each and every one of the lucky tanglers who have been so fortunate to have shared this experience with each other. What a creative, engaging, and interactive activity. And the bonus video at the end... Priceless! Cheers! What a fun challenge... and you didn't even get your tongue twisted as you sang the 12 Days of 3Zs. Thanks to all of you at HQ, and your continuing to reach outside the box with our wonderful Zentangle Art. congrats to all winners and especially the ones I know: Marieke and Michele !! I' ve learned a lot from 12 days. Gratitude and joy! Love to all tanglers and a huge thank you to everyone at Zentangle HQ! Life is full of wonderful surprises just like a Zentangle tile. I really liked mosaic you`ve made. Need to learn this technique and read previous posts asap! I (Wanyi) got the two boxes of 3z tiles, thank you all! You could be qualified to get a Apple iPhone 7. On the last day of 3Zs . . .
On the eleventh day of 3Zs . . .
On the tenth day of 3Zs . . .
On the ninth day of 3Zs . . .
On the eighth day of 3Zs . . .
On the 7th day of 3Zs . . .
On the sixth day of 3Zs . . .
On the fifth day of 3Zs . . .
On the fourth day of 3Zs . . .
On the third day of 3Zs . . .
On the Second Day of 3Zs . . .
On the first day of 3Zs . . .